Religious leaders responded to global violence and terrorism with solidarity and prayer on Wednesday in Washington, D.C. 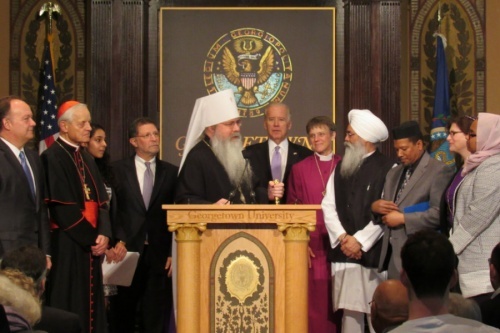 Religious leaders gather at Georgetown Dec.16, 2015. Credit: Matt Hadro/CNA. “We will stand together, strengthened by the faith of each one in this room and the solidarity we share, simply because we know how to answer the question ‘Who is my neighbor?’” stated Cardinal Donald Wuerl of Washington, D.C., preaching on the Parable of the Good Samaritan in the Gospel of Luke at a Dec. 16 interfaith prayer service. “Let us never forget, we are each other’s neighbor,” he added. The “Interfaith Gathering for Solidarity, Understanding, and Peace” took place at Georgetown University on Dec. 16, featuring prayers, readings, and reflections from Catholic, Christian, Muslim, Sikh and Jewish leaders. The purpose of the gathering was to give public witness to values of solidarity and tolerance in the wake of recent global and domestic violence, and subsequent animosity shown towards certain religions. Leaders of different faiths gathered to “realize the shared resources of our traditions,” as Georgetown University’s president John DeGioia stated in his opening remarks. We must never let violence and terror change how we see innocent persons, Cardinal Wuerl insisted. Vice President Joe Biden was in attendance and addressed the audience just before the service ended. Man, created “in the image of God, in the likeness of God,” possesses “free will” and the ability to “discern,” said Rabbi M. Bruce Lustig, a senior rabbi at the Washington Hebrew Congregation, in a reflection on Genesis 1:26-27. “Let this gathering be our promise: that we will choose love over hate. Peace over violence. That we will endeavor to live as God’s children bringing compassion and tolerance and building for our children and our children’s children a world better than ours,” he continued. “Enable us to love others with a sacrificial and self-emptying love that we see in your servant Jesus Christ, who comes to us in extreme humility,” he prayed.